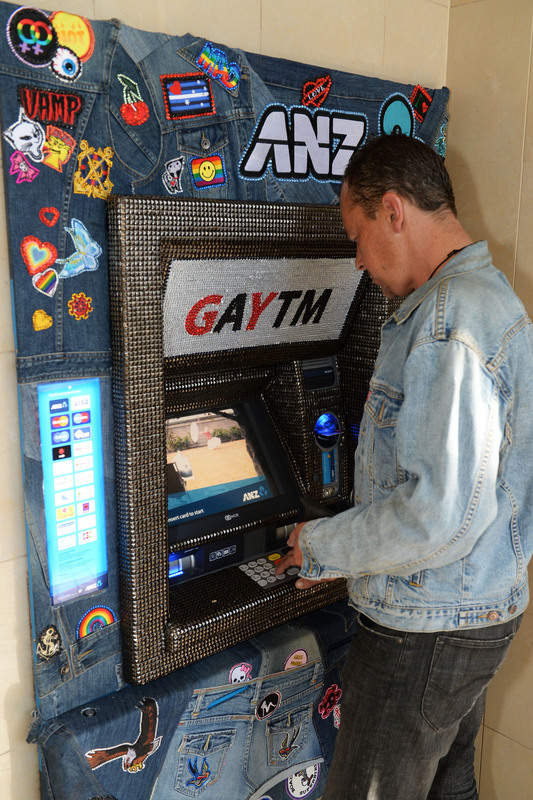 ANZ, one of Australia’s largest banks has taken the concept of the “pink dollar” to a whole new level with the installation of “GAYTMS” to celebrate Sydney’s world famous Gay and Lesbian Mardi Gras. 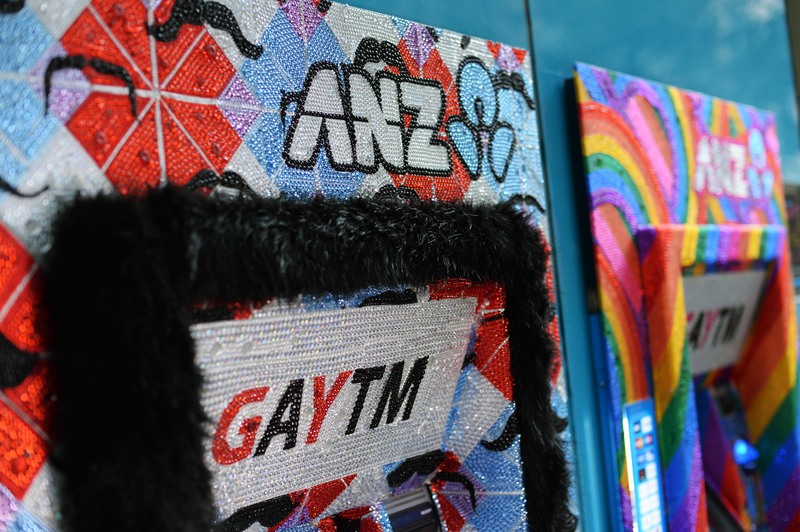 ANZ has commissioned artists to individually convert 10 ATMs into “GAYTMs” to celebrate their partnership with the Sydney Mardi Gras festival. Decorated in colours, patterns and jewels inspired by LGBTI culture, each GAYTM tells a unique story. The artworks include the “Hello Sailor” GAYTM, designed to celebrate the Defence Force allowing its members to march in uniform for the first time last year and “Pride”, representing the rainbow, a symbol of diversity, amongst others all created in partnership with the LGBTI community. 2014 marks the eighth consecutive year that ANZ has partnered with Sydney Mardi Gras and this year the bank will donate ATM operator fees for non-ANZ cardholders from its GAYTMs during the festival to Twenty10, a not for profit organisation that supports young people and their family and friends who are dealing with gender and sexuality issues. It is truly inspiring to see a major corporation such as ANZ embrace its LGBTI employees and customers. Mark Hand, Chair of ANZ Australia’s Diversity Council said: “This association is all about encouraging an environment where everyone feels comfortable being themselves at work. You don’t get the benefits of a diverse workforce if some people are expending vast amounts of energy pretending to be something they are not and trying to conform. “We want the best people to work at our organisation and given how many people identify as LGBTI, we want to make sure that everyone feels welcome here at ANZ – regardless of their sexual orientation or gender identity,” Mr Hand said. ANZ’s GAYTMs can be found in various Sydney locations on Oxford Street, Pitt Street, George Street, Castlereagh Street, Surry Hills and Bondi Junction. More information including a map of the GAYTM locations can be found by clicking here. ANZ will share photos and news about the GAYTMs through social media channels using #GAYTM. Belvedere Vodka and DNA Magazine hosted a “Make Believe” party on Saturday 2nd March to coincide with the Sydney Mardi Gras parade. Upstairs Beresford was transformed into a “Winter Wonderland” where celebrities, musicians and Sydney’s party people enjoyed bespoke Belvedere cocktails and premium entertainment from the likes of Van She, Collarbones and DJ Kitty Glitter. The event was hosted by international party queen Jodie Harsh and continued long after the parade had finished. Many brands have cautiously dipped their toe into the “gay dollar” pond but it’s rare to see a brand such as Belvedere associate itself so wholeheartedly with the gay community. I guess this is because brands have traditionally been affraid of isolating mainstream consumers by aligning with polarizing smaller markets. Disclaimer: Although I am the PR Account Manager for Belvedere Vodka, their decision to host an event to coincide with Mardi Gras was made independently of my input. I had always been an adorer of the Belvedere brand and was very impressed by their previous years’ gay events long before I was even on the payroll.